This little alleyway is irresistible to me. Sometimes it's open, sometimes it's closed but when it's open it leads to the Hôtel particulier Adhémar de Lantagnac, which is not an hotel at all but is now used by the Service du Patrimone. An 'hôtel particulier' is a beautiful house that once belonged to a family of prominent citizens. Here you'll find a small boutigue selling books on Menton and works of the artists of the region. There are exhibitions throughout the year but really just go in and look around - enjoy the frescoes, many sadly damaged, the beautiful old shutters, the original glass in the windows. You'll find it at 24, Rue Saint Michel (the pedestrian street) and not far from Place aux Herbes. Cette petite ruelle est irrésistible pour moi. Parfois, elle est accessible, parfois non, mais quand son portail est ouvert, elle conduit à l' Hôtel particulier Adhémar de Lantagnac, ce qui n'est pas un hôtel dans le sens ordinaire, et qui est maintenant utilisé par le Service du Patrimone. 'Hôtel particulier' signifie que c'est une belle maison qui appartient à une famille de notables de la ville. Ici vous trouverez une petite Boutique qui vend de livres sur Menton et sur les œuvres des artistes de la région . 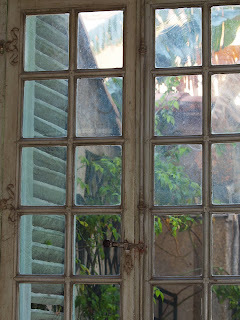 Il y a des expositions tout au long de l'année, mais on peut juste entrer et pour regarder le décor, admirer les fresques dont beaucoup malheureusement sont endommagées, les beaux volets anciens, les carreaux d'origine des fenêtres. Vous le trouverez au 24, Rue Saint-Michel ( la rue piétonne ) et non loin de la Place aux Herbes. Gosh Jilly I can't believe I missed the 5th Anniversary of your blog. You know how much I've enjoyed your images from magical Menton. Congratulations and all the best for five more years, what a huge achievement, it's such a commitment an enjoyable one I know, I absolutely take my hat off to you for managing two blogs.btw M. Mayor did you proud, lovely portrait. Very pretty! I photographed almost this same gate (well, here in Belgrade), all covered with snow. Wasn't a great shot, so I deleted it. This scene totally invites us to want to explore more. This is a delightfully quaint alleyway. 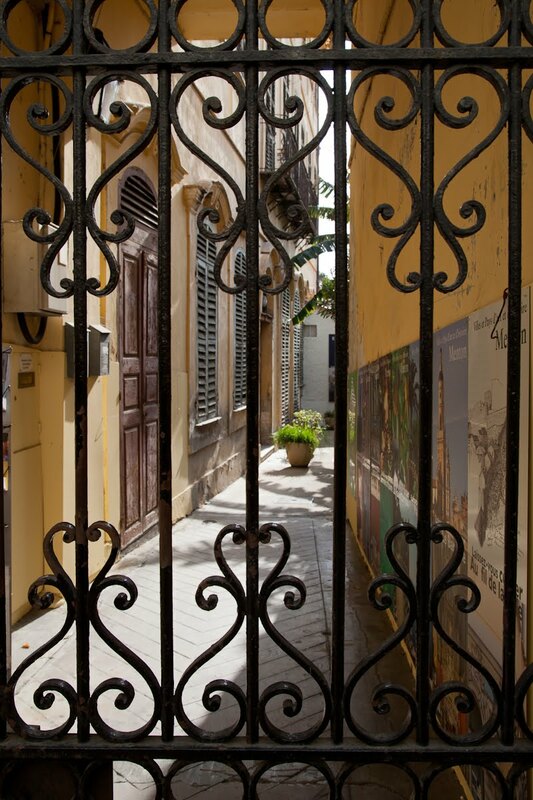 The iron gate is wonderful, as is the alley we see beyond it. Gosh, what a very nice vieille France kind of name for a hotel! I rather like your window shot Jilly!! !